The post Propellerhead’s Reason 10.3 update comes with improved performance appeared first on rekkerd.org. The post MuTools releases MuLab 8: Flexible Audio Sequences, Creative Time Stretching & more appeared first on rekkerd.org. Blue Cat’s Dynamics flexible all-in-one dynamics processor 30% OFF! The post Tracktion launches Waveform 10 digital audio workstation for macOS, Windows & Linux appeared first on rekkerd.org. The post Get 30% OFF PreSonus Studio One 4 digital audio workstation appeared first on rekkerd.org. The post Bitwig Studio 2.5 now available with new Clip Blocks, overhauled plugin hosting & more appeared first on rekkerd.org. The post Amped Studio releases 7 new devices in update of cloud-based DAW appeared first on rekkerd.org. The post Image Line updates FL Studio digital audio workstation to v20.1.2 appeared first on rekkerd.org. Live 10.1 was announced today, but I sat down with the team at Ableton last month and have been working with pre-release software to try some stuff out. Words like “workflow” are always a bit funny to me. We’re talking, of course, mostly music making. The deal with Live 10.1 is, it gives you some new toys on the sound side, and makes mangling sounds more fun on the arrangement side. Let’s look at those two groups. User wavetables. 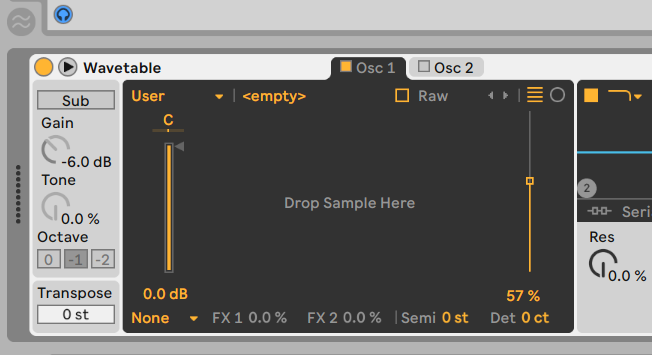 Wavetable just got more fun – you can drag and drop samples onto Wavetable’s oscillator now, via the new User bank. You can get some very edgy, glitchy results this way, or if you’re careful with sample selection and sound design, more organic sounds. Here’s how it works: Live splits up your audio snippet into 1024 sample chunks. It then smooths out the results – fading the edges of each table to avoid zero-crossing clicks and pops, and normalizing and minimizing phase differences. You can also tick a box called “Raw” that just slices up the wavetable, for samples that are exactly 1024 samples or a regular periodic multiple of that. Give me some time and we can whip up some examples of this, but basically you can glitch out, mangle sounds you’ve recorded, carefully construct sounds, or just grab ready-to-use wavetables from other sources. But it is a whole lot of fun and it suggests Wavetable is an instrument that will grow over time. 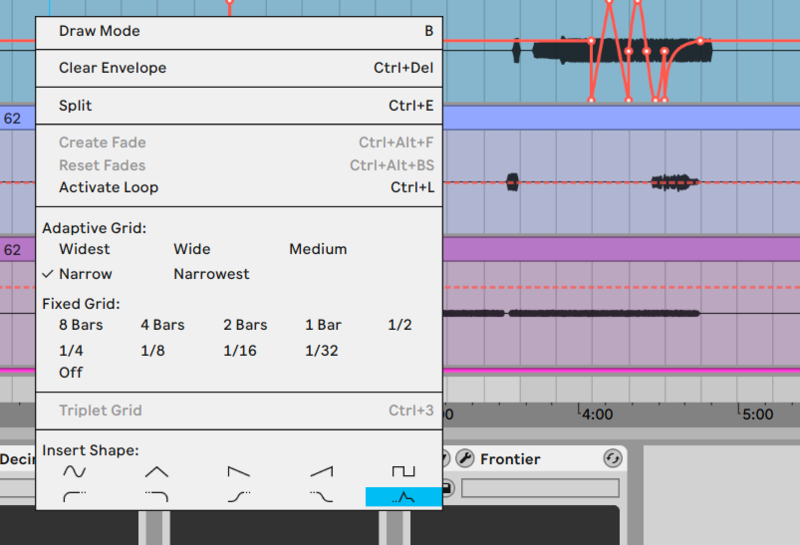 At first glance, you might think that’s all that’s here, but in typical Ableton fashion, there are some major updates hidden behind those vanilla, minimalist controls. So now you have Repitch, Fade, and Jump modes. And there’s a Modulation section with rate, filter, and time controls (as found on Echo). Oh, and look at that little infinity sign next to the Feedback control. And the new Delay. Look closely – there are some major new additions in there. Channel EQ. This is a new EQ with visual feedback and filter curves that adapt across the frequency range – that is, “Low,” “Mid,” and “High” each adjust their curves as you change their controls. Since it has just three controls, that means Channel EQ sits somewhere between the dumbed down EQ Three and the complexity of EQ Eight. 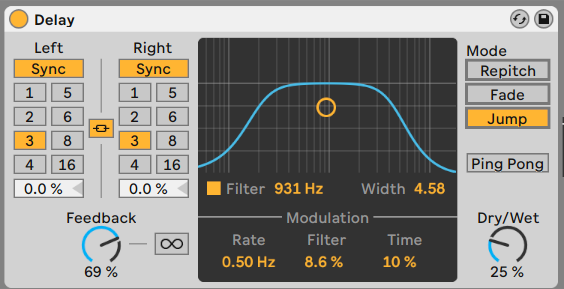 But it also means this could be useful as a live performance EQ when you don’t necessarily want a big DJ-style sweep / cut. The stuff above is fun, but you obviously don’t need it. Where Live 10.1 might help you actually finish music is in a slew of new arrangement features. Live 10 felt like a work in progress as far as the Arrange view. I think it immediately made sense to some of us that Ableton were adjusting arrangement tools, and ironing out the difference between, say, moving chunks of audio around and editing automation (drawing all those lovely lines to fade things in and out, for instance). But it felt like the story there wasn’t totally complete. In fact, the change may have been too subtle – different enough to disturb some existing users, but without a big enough payoff. So here’s the payoff: Ableton have refined all those subtle Arrange tweaks with user feedback, and added some very cool shape drawing features that let you get creative in this view in a way that isn’t possible with other users. Fixing “$#(*& augh undo I didn’t want to do that!” Okay, this problem isn’t unique to Live. In every traditional DAW, your mouse cursor does conflicting things in a small amount of space. Maybe you’re trying to move a chunk of audio. Maybe you want to resize it. Maybe you want to fade in and out the edges of the clip. Maybe it’s not the clip you’re trying to edit, but the automation curves around it. $#(*&*%#*% …. Noo errrrrrrrgggggg … GAACK! SDKJJufffff ahhh…. Quick zoom shortcuts. I’ll do a separate story on these, because they’re so vital, but you can now jump to the whole song, details, zoom various heights, and toggle between zoom states via keyboard shortcuts. There are even a couple of MIDI-mappable ones. Clips in Arrangement have been adjusted. From the release notes: “The visualisation of Arrangement clips has been improved with adjusted clip borders and refinements to the way items are colored.” Honestly, you won’t notice, but ask the person next to you how much you’re grunting / swearing like someone is sticking something pointy into your ribs. Pitch gestures! You can pitch-zoom Arrangement and MIDI editor with Option or Alt keys – that works well on Apple trackpads and newer PC trackpads. And yeah, this means you don’t have to use Apple Logic Pro just to pinch zoom. Ahem. The Clip Detail View is clearer, too, with a toggle between automation and modulation clearly visible, and color-coded modulation for everything. The Arrangement Overview was also adjusted with better color coding and new resizing. Free-hand curves more easily. With grid off, your free-hand, wonky mouse curves now get smoothed into something more logical and with fewer breakpoints – as if you can draw better with the mouse/trackpad than you actually can. Simplify automation. There’s also a command that simplifies existing recorded automation. Again – finally. 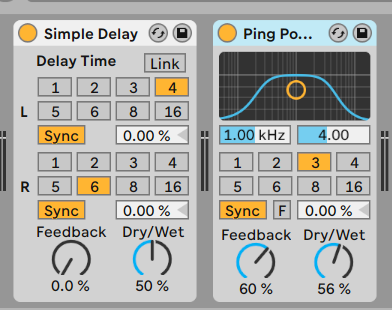 So that fixes a bunch of stuff, and while this is pretty close to what other DAWs do, I actually find Ableton’s implementation to be (at last) quicker and friendlier than most other DAWs. 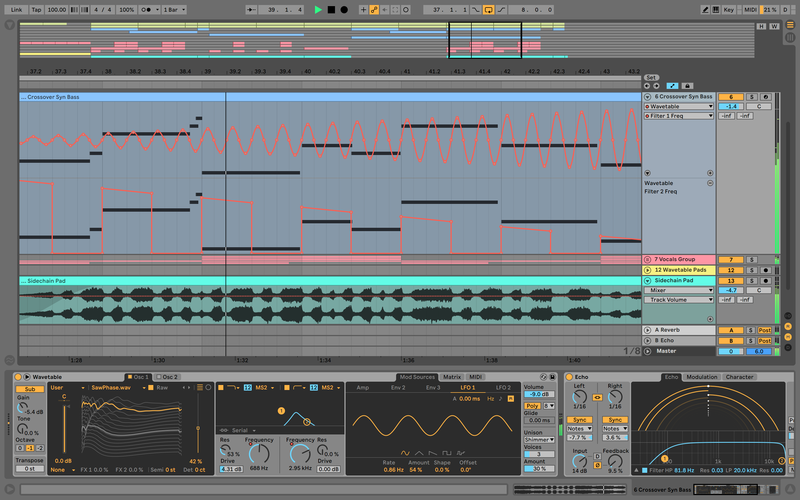 But Ableton kept going and added some more creative ideas. Insert shapes. Now you have some predefined shapes that you can draw over automation lanes. It’s a bit like having an LFO / modulation, but you can work with it visually – so it’s nice for those who prefer that editing phase as a way do to their composition. Sadly, you can only access these via the mouse menu – I’d love some keyboard shortcuts, please – but it’s still reasonably quick to work with. Modify curves. Hold down Option/Ctrl and you can change the shape of curves. Stretch and skew. Reshape envelopes to stretch, skew, stretch time / ripple edit. Insert Shapes promises loads of fun in the Arrangement – words that have never been uttered before. You can freeze tracks with sidechains, instead of a stupid dialog box popping up to tell you you can’t, because it would break the space-time continuum or crash the warp core injectors or … no, there’s no earthly reason why you shouldn’t be able to freeze sidechains on a computer. You can export return and master effects on the actual tracks. I know, I know. You really loved bouncing out stems from Ableton or getting stems to remix and having little bits of effects from all the tracks on separate stems that were just echos, like some weird ghost of whatever it was you were trying to do. And I’m a lazy kid, who for some reason thinks that’s completely illogical since, again, this is a computer and all this material is digital. But yes, for people are soft like me, this will be a welcome feature. So there you have it. Plus you now get VST3s, which is great, because VST3 … is so much … actually, you know, even I don’t care all that much about that, so let’s just say now you don’t have to check if all your plug-ins will run or not. Live 10.1 is keeping pace, with the beta you download now including Max 8.0.3. Ableton haven’t really “integrated” Max for Live; they’re still separate products. And so that means you probably don’t want perfect lockstep between Max and Live, because that could mean instability on the Live side. It’d be more accurate to say that what Ableton have done is to improve the relationship between Max and Live, so that you don’t have to wait as long for Max improvements to appear in Max for Live. Live 10.1 is in beta now with a final release coming soon. Thanks to Ableton for those short videos. More on these features soon. The post Ableton Live 10.1: more sound shaping, work faster, free update appeared first on CDM Create Digital Music.